Due to unprecedented demand, the entire stock of Apex Challenge hoodies was sold in just a few hours at the Apex Extreme. But don't panic - an order for more has been placed and will be arriving soon! The exclusive blue and white hoodies with contrast piping and side panelling feature a high quality embroidered Apex logo on the front. They're available to everyone taking part in the event, or anyone else who's proud to be associated with the Apex Challenge. They're a truly flexible garment - great for keeping you warm on cold winter evenings, while still looking cool in the height of summer! If you've not yet got one, you can now take advantage of our mail order facility. Simply send a cheque for £22.50 payable to 'Apex Challenge', together with your name, address and size, to Apex Challenge, 14 Sanderson Close, Hull, HU5 3DE. This price includes postage and packing costs. 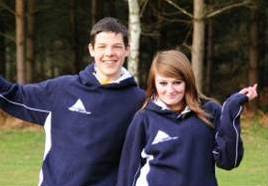 Apex Challenge hoodies are available in Small, Medium, Large and Extra Large sizes. The final few Apex Challenge 2010 yellow t-shirts are also available for just £5 by sending a cheque to the same address. Remaining sizes are small and medium only.